To read part one of this series, click here. 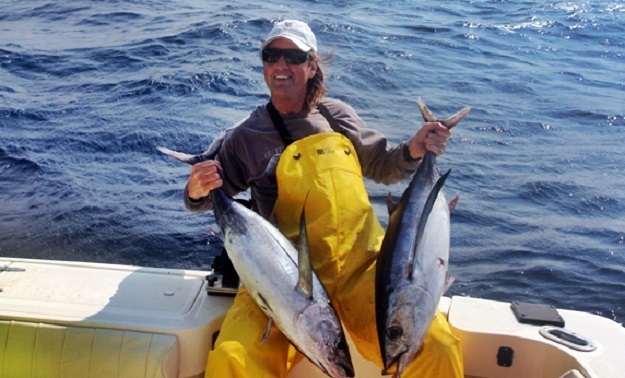 For the complete “Tuna Fishing Washington” series, visit our tuna fishing page. Your boat is ready. Your gear is ready. Now it is time to head out to the tuna grounds. You still have some very important decisions to make before leaving the harbor. What time do I cross the bar? What does the marine forecast look like? Where am I headed? Even though you are extremely pumped to make this journey you still have to carefully consider these issues. Just like salmon fishing they are important – probably even more so. Remember that your boat is much heavier than normal and it will ride differently. Weather: I use a simple equation to determine whether I am going or not. I take the forecasted swell height and add the wind wave height. If the total of these two numbers is equal to or greater than the seconds between swells, we do not go. Example: the swell is forecasted to be 8 feet and the wind waves are forecasted to be 3 feet. The time between swells is forecast to be 8 seconds. Add the swell height and the wind waves together 8 + 3 = 11. 11 is great than the 8 seconds between swell so it is a no go day. If any number in the wind forecast is 25 knots or more it is also a no go day. Your life and the safety of your crew are way more important than any fish. The Destination: Most tuna fisherman out of Westport fish three areas: Grays Canyon (west of Grays Harbor), Guide Canyon (west of Willapa Bay), or Astoria Canyon (west of Cape Disappointment). These are all within range for most properly equipped boats. 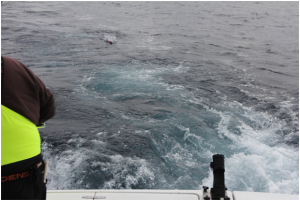 These areas seem to hold bait and have the temperature breaks that we look for when searching for Albacore tuna. The Run: All of our factors above are perfect so we are headed out. 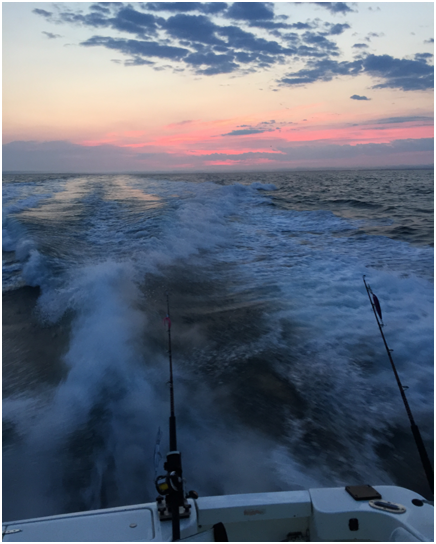 Some of the sunrises during the run out for tuna are just incredible and the ocean is just full of life at sunrise. As we clear the jetties and turn to the southwest the anticipation and adrenalin makes you almost giddy. You will know you have reached the tuna grounds when you are in deep turquoise blue colored water unlike the green water found along the coast. As we approach the planned destination it is very important to have all eyes on the boat looking over the water for telltale signs of tuna. Look for birds hitting the water or even tuna themselves feeding on the surface. We call them JUMPERS! If you see these signs, stop and start fishing. Start out with the starboard side of the boat and the long side of the W. I would choose a Plain Cedar plug or a Green and Yellow Clone lure. This lure should be placed 40 to 50 feet behind the boat. Next would be the starboard corner of the boat or the bottom of the W. For this lure I would choose a diving plug like an XRap 20 in the Bonita color pattern. This lure should be 20 feet behind the boat. Watch this lure and ensure that it tracks straight in the water. If not adjust the eye on the plug. Next is the center or the WAY BACK lure. I would choose a small lure for this one, something like a lead head swim bait or another Cedar plug. More times than not this will be the first rod that gets hit. Working our way to the port side corner I would run either another diving plug or a heavier weighted Clone lure. The idea here is to have something underneath the prop wash to help bring fish up from deep. The last rod then is the port side rod and the long side of the W. I would run a daisy chain or a spreader bar on this rod. The idea here is to simulate a small school of baitfish and the last one has a hook on it. Albacore are ferocious feeders so the small school of fish will turn them on and bring them up. Last but not least, make sure the clickers are in the on position on your trolling rods! 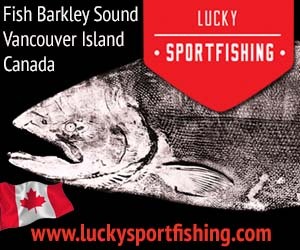 The Strike: Salmon fishermen often ask me how they will know when a tuna hits the rod. Many anglers are accustomed to seeing the traditional tap-tap of a Salmon bite. Well this will be nothing like that. Imagine hooking a passing car on the road at 30 mph or getting your line wrapped around a turning prop. That is about like it! There is No Doubt. 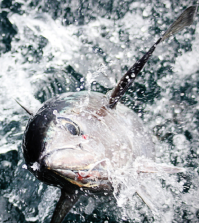 Albacore tuna hit with such force and runs with so much speed you will be asking yourself; “Will it stop before I run out of line?” This is the moment that you will understand everything I have said about rods, reels, drags, and line capacity. I can almost promise that at this moment, you will also be giggling like a child on Christmas morning. Fish on! Now What? It is a good idea to have a plan before the fish hits as to who is going to do what. Decide who is going to grab the first troll rod when it goes off; who is going to clear the remaining gear, and if you are deploying live bait, who has that job. Have one person on your boat fight the troll hooked fish but keep the boat moving forward for a few seconds. 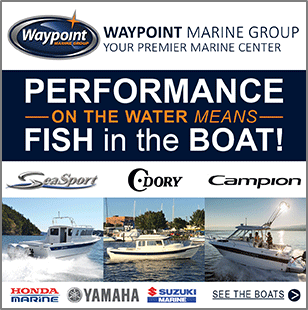 If the fish hits a port side rod, turn the boat to port about 90 degrees. If it hits on the starboard side, turn to starboard. You may get multiple hook ups with other troll rods. If you are going to use live bait, this is where you deploy your live bait. If you just want to troll, then just get the troll hooked fish in the boat, reset your spread and resume trolling. It would be a good idea to stay in that general area because tuna are schooling fish and the schools are quite large. Live Bait: Here is my technique for deploying live bait and attempting to do a “bait stop” from the troll. If I am trolling into the wind I just slowly stop the boat and shut down my engines. If I am trolling with the wind turn 90 degrees to the side that the fish hit on and shut the boat down. At the same time have someone toss a small scoop of live anchovies into the water. Hook a live bait and toss it into the water. Keep your reel set in free spool with your thumb gently on the reel to keep it from back lashing and let the bait swim away from the boat, feed line off your reel to help the bait swim away from the boat at the same time paying very close attention to the rate at which the line is coming off the reel. Keep working the bait away from the boat for approximately two minutes. If a tuna has not hit within a couple of minutes, reel in and start over. Make sure you have a lively bait on your hook. 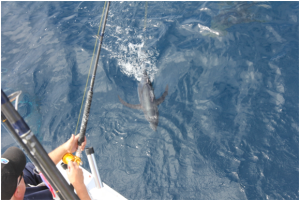 When a tuna hits, as your bait is swimming away from the boat, you will notice some changes. The line starts peeling off the reel under your thumb. Count to five and then engage the drag. When you do this, make sure that you have a good grip on your rod because you just hooked into that passing sports car that we talked about in the trolling section. 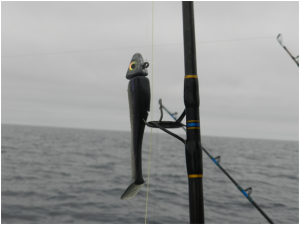 Once you engage the drag, the tuna will realize he is hooked and run, so just hold on and wait for him to stop! There isn’t anything you can do at this point but hang on! Remember the rod, reel, and line capacity discussion? All will be made clear at this point. You will now experience one of the strongest fighting fish in the ocean. It is not uncommon for everyone on the boat to be hooked up at the same time. Now this is just Fun! Once he stops, you can begin working the fish to the boat but don’t be surprised if he takes several more runs. 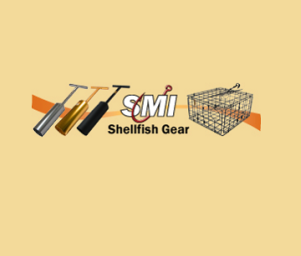 Swim Baits: As we venture into the tuna grounds, and even while we are trolling or on a bait stop, we often use swim baits. The best color choices here in the Pacific Northwest are purple and black or blue and white. Always be on the lookout for tuna showing themselves on the surface. Make sure you have a cast-able rod and reel ready with a swim bait tied on. When you see the tuna, cast the bait right in the middle of them. Do not try and lead them, just put it right on top of the fish. These fish are actively feeding and in most cases will attack the bait as soon as you start to retrieve it. When this happens set the hook and watch it run. Just like live bait fishing. How many tuna is enough? Tuna fishing is extremely exciting and can get out of hand really quickly. Here in Washington state there is no bag limit on tuna. However, each one of us is responsible to protect this resource and not abuse it. You can easily put too many fish on your boat and end up wasting them in the long run. Remember that you cannot sell the tuna you catch. It is illegal. If you are planning to home can the tuna, here is a rule of thumb that you can use. One average size tuna will yield seven pints of canned tuna. 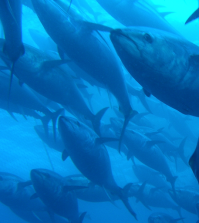 Five to eight tuna will give the average person more than enough fish to enjoy for a year. Please keep that in mind and fish responsibly. 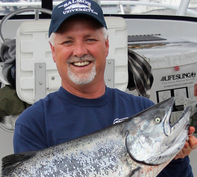 Kevin Lanier is the owner of KC Sportfishing Charters out of Westport, WA (425-328-8558). He and his wife Cyndi also own Dockside Art, Gifts, and Tackle. 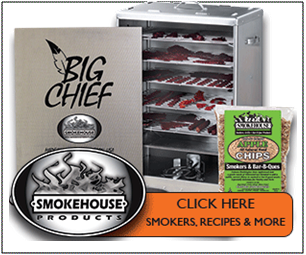 They offer a wide variety of tackle, fishing gear, fresh bait and ice.